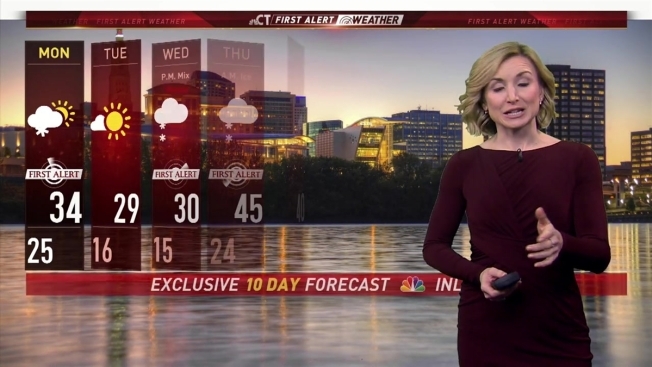 NBC Connecticut meteorologists are tracking a storm that will bring accumulating snow that will make a mess of Monday morning. While the storm will not be strong, it will make for slippery travel for the Monday morning commute. Snow is expected to develop around 9 p.m. on Sunday and last through the morning commute on Monday. Most of the snow should be light to moderate and will accumulate 3-6 inches for most of inland Connecticut. The I-95 corridor may see some mixing with sleet by morning which will keep amounts between 2-4 inches. The snow tapers to snow showers late Monday morning into the early afternoon. The storm is already prompting some snow closings and delays. You can see them here. The next storm system to watch will be Wednesday night into Thursday morning. At this time, it appears we’ll have a scenario similar to our last storm. Snow to ice and rain look likely.